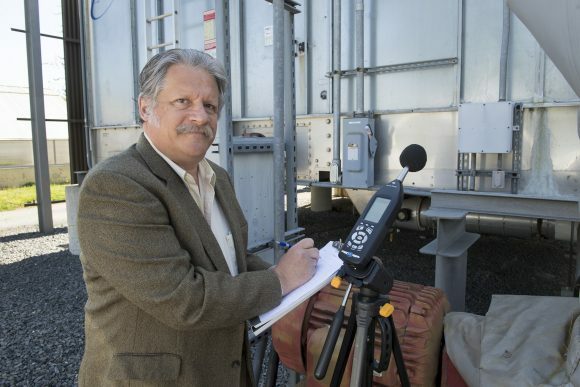 Share the post "Battling Noise Pollution is a National Challenge for Rutgers Eric Zwerling"
Eric Zwerling, director of the Rutgers Noise Technical Assistance Center, checks the sound level near a condenser. Photo: Nick Romanenko/Rutgers University. Eric Zwerling has led America’s last noise control center at Rutgers University–New Brunswick for 28 years, and fighting noise pollution remains an uphill battle. Noise – unwanted or disturbing sound – in some ways can be as noxious as smoke. Noise disrupts sleep, conversations and quality of life, and it’s linked to stress-related illnesses, high blood pressure, hearing loss and lost productivity, the U.S. Environmental Protection Agency says. 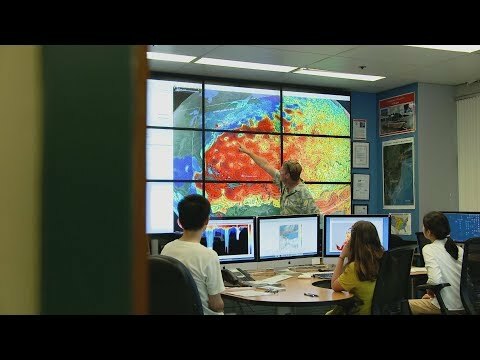 Since the 1970s, the Rutgers noise center, which is in the Department of Environmental Sciences within the School of Environmental and Biological Sciences, has provided training and assistance to local officials and others in New Jersey, nationwide and abroad. It is the last center formerly funded by the EPA Office of Noise Abatement and Control, which closed in the early 1980s. The Rutgers noise center has trained thousands of investigators how to measure sound levels to check compliance with local or state noise codes. And for years, the N. J. Department of Environmental Protection has contracted with the center to provide training. State law requires all noise enforcement officers in New Jersey to take Rutgers’ three-day certification course on community noise enforcement. It’s taught by Zwerling and offered quarterly; a refresher course is required every two years. Zwerling has also given customized courses in New York City, Florida, Alaska, British Columbia, Barbados and other areas. He’s helped New York City and other municipalities write noise ordinances, and he responds to hundreds of requests for assistance from townships, police departments, corporations, health departments and other entities annually. He also chairs the state Noise Control Council subcommittee that’s drafting proposed changes to the state noise code, which sunsets next year.